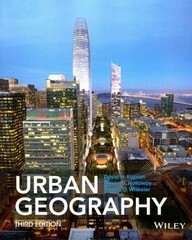 Urban Geography 3 Edition Urban Geography offers a comprehensive treatment of urban geography, fully exploring the origins and development of cities. It focuses on uncovering the excitement and richness found in cities, while tackling a wide variety of urban challenges. The text covers the Urban Geography field, both as it has evolved and as it exists today. Kaplan includes the most current research in urban studies, introducing elements of urban theory and methodology, and addresses the urban experience as a global one. Urban Geography presents key concepts in a straightforward structure, creating a user-friendly experience for all readers.